Donovan scores a hat trick and Ishizaki is solid as L.A. advances in the MLS playoffs. CARSON.–If there was any trepidation or fear on the faces of the L.A. Galaxy players or fans before the start of Sunday night’s playoff match against Real Salt Lake, it was soon replaced with relief, then joy, then outright delirium. Midfielder Landon Donovan appeared nowhere near ready to begin his announced retirement, scoring three goals with an assist, as the Galaxy steamrolled over their guests, 5-0, and advance to the Major League Soccer Western Conference final. L.A. won the two-game series over Real Salt Lake on aggregate goals; since the two clubs played to a scoreless draw in their first match, Sunday’s meeting was a win-or-go-home affair. L.A. wasted little time in seizing control of the game, scoring on a header from Donovan in the 10th minute. The celebration was on from that point and the euphoria continued when Donovan assisted Robbie Keane on a scoring drive in the 20th minute. The 32-year-old Donovan, whose 25 playoffs goals lead MLS, added another score at minute 54 and left to a standing ovation when he was replaced by Alex Gordon in the 83rd minute. Galaxy midfielder Stefan Ishizaki, in his first year with the club, turned in a solid and energetic 90-plus minutes, and was as wowed as the fans with Donovan’s performance. He said the team had basically decided that this was not to be the final game of Donovan’s career. “Yeah, I had my mind set on it,” Ishizaki said, adding that his side were focused well before the opening whistle. L.A. controlled the night in seemingly every possible way, not only in scoring, but also in possession and shots on goal, 19-4. For his part, Donovan had expressed little desire to wind up his playing days prior to Sunday’s match. Galaxy defender Robbie Rogers said there was a great deal of confidence in the clubhouse as to whether their season would continue after Sunday. “I don’t think any of us were worried about this being Landon’s last game,” Rogers said. 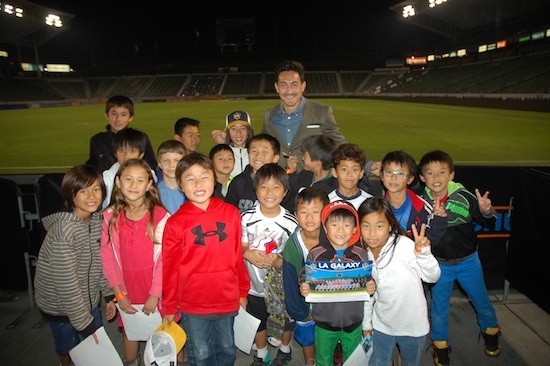 Following the match, Ishizaki spent several minutes meeting and signing autographs with members of the L.A. Hawks, a youth football club who had a group of players in attendance. He thanked the kids for their support and promised them he would do his best as the playoffs continued.